1) (co. Gloucester). Gu. a fesse chequy or and az. a bordure ar. 2) (Henllys, co. Anglesey, a.d. 1460, previously settled in co. Lancaster). Gu. on a fesse or, betw. a mullet in chief and an escallop in base ar. three martlets az. Crest—A wivern vert in bullrushes ppr. Motto—A Deo et rege. 3) (London; descended from co. Stafford, and of Norwood, co. Middlesex). Ar. a chev. gu. betw. three cinquefoils az. Crest—A wolf’s head erased sa. 4) (Wolverhampton, co. Stafford). Ar. on a chev. gu. betw. three cinquefoils az. as many bezants. Crest—A wolf’s head ar. 5) (Blechingly, co. Surrey; granted 6 Aug. 1662, to Rev. 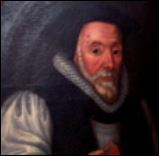 William Hampton, Rector of that place). Gu. a fesse chequy ar. and sa. a bordure or. Crest—A demi eagle displ. or. 6) (Wales). Gu. a fesse ar. and label of five points of the second. 7) (Archbishop of Armagh. Fun. Ent. of Christopher Hampton, Lord Primate of all Ireland, d. 3 Jan. 1624). Gu. a fess erm. in chief a label of five points or. 8) Ar. a chev. componee az. and purp. betw. three martlets gu. Crest—A greyhound sejant holding in his mouth a hare. 9) (quartered by Drake, of Ashe and Otterton; John Drake of the latter, temp. Henry V., to. Christian, dau. and co-heir of John Billet, by Alice, his wife, dau. and co-heir of Warren Hampton. Visit. Devon, 1620). Gu. on a fess ar. two mullets sa. 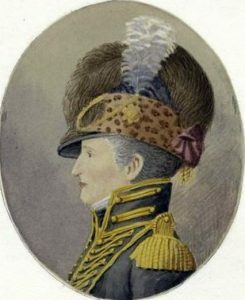 10) (Norwood, co. Middlesex; Robert Hampton, Esq., grandson of Francis Hampton, Esq., co. Stafford. Visit. Middlesex, 1663). Ar. a chev. gu. betw. three cinquefoils az. Crest—A tiger’s head erased ar. 11) Per fesse gu. and or, three cinquefoils counterchanged. 12) Ar. a fesse chequy or and az. betw. six martlets gu. 13) Per fesse gu. and ar. three roses counterchanged barbed and seeded vert and or. 14) (Lord Mayor of London, 1472). Gu. a fesse componee or and ae. a bordure ar. 15) Gu. a fesse ar. 16) Gu. on a fesse ar. a mullet sa. 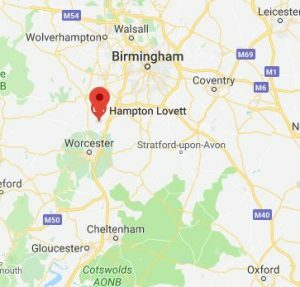 This Anglo-Saxon name is an local name meaning “of Hampton”, with 13 different locales or parishes with this name being present in England in the diocese of Worcester, Hereford, Salop, London, Oxford, Lichfield, and Exeter. One author states it means “the town of the hill” and is a village in Middlesex, England. The name derives from the Old English word ham, meaning homestead, or hamm, meaning water meadow, or hean, meaning high, plus the suffix tun, meaning settlement or enclosure. These villages were recorded in the Domesday Book of 1086 as Hantone, Hantune, Hantun, and Hamntone. One source claims the earliest place with this name was Hamtona in 716 AD, which later became Hampton Lovett. The earliest known person bearing this last name was Philip de Hamtone, documented in the Cartulary of Oseney Abbey in 1166 AD. The Hundred Rolls of 1273 AD, a census of Wales and England, known in Latin as Rotuli Hundredorum, documents three people bearing this surname: John de Hampton in county Somerset, William de Hamptone in county Hunts, Nicholas de Hampton in county Wiltshire, Philip de Hampton in county Cambridge, and Geoffrey de Hampton in county Lincolnshire. A one Rogerus de Hamtone wirnessed the resigning of lands in Edeluestun to the church of Glasgow in 1233 AD. Edith de Hampton was recorded in Worcestershire in 1221 AD and Richard Hampton was recorded in Sussex in 1327 AD. Early marriages involving this surname include John Hampton to Elizabeth Laymere in 1575, and an early baptism includes William, son of John Hampton, in 1661 at St. James Clerkenwell. The famous genealogist Bernard Burke’s book “Peerage and Baronetage” discusses this surname. It begins with a discussion of The Baron Hampton, Sir Herbert Stuart Pakinghton, of Hampton Lovett and of Westwood in count Worcester. The surname was first established in Staffordshire where the family held title and lands at Wolverhampton for many centuries. Joseph Hampton was born in 1690. He married Mary Canby in 1722 in Buckingham. Before passing away in 1767 in Pennsylvania, he had a child named John Hampton. John was born in 1724 in Wrightstown, PA. He married Ann Croasdale and he had two children: Arenarth Hampton and John Hampton. John was born in 1763. He married Mary Betts and had a daughter named Asa C.
Joseph Hampton left the port of London to come to Virginia aboard the Thomas in 1635. A one John Hampton was recorded as living in Virginia in 1623, “At Bucke Row”. William Hampton came to Virginia in 1620 (at the age of 40) aboard the Bona Nona, with his wife Joannae. Other early settlers include Thomas Hampton (Virginia 1637) and Christopher Hampton (New York, 1824). Family mottoes for Hampton is A Deo et rege, meaning “From God and the king”. Famous people with this last name include: 1) Wade Hampton (1752-1835) who was a solider, politican, wealthy planer, and two-term United States Congressman from South Carolina, 2) James Hampton (1721-1778) who was an English writer and cleric who translated documents from Ancient Greek, and 3) Captain Trevor Hampton (1912-2002) who was a scuba diving pioneer from the United Kingdom. I am the great granddaughter of Zora Meercilla and Mark Clifton Hampton ,, My grandmother was Monteen Mercilla Hampton and I am the great , great ,great granddaughter of Georg Washington Hampton and the Great , Great, Great niece of Wade Hampton . I just need to Know if the Hampton family of Mark Clifton Hampton are kin to the Queen?